Someday, the domestic goddess will have a staff and her days of making roll-out cookies for holidays will end. Until then, the dg will don her Valentine’s Day tiara, open a bottle of beer, take out her rolling pin and make cookies at her kitchen table the same way that she tells you to do it. I went through all the details of these cookies with you before the winter holidays, so I’ll refer you to my previous columns: Holiday Prep: The Easiest Holiday Cookies Ever, Parts 1, 2 and 3 and tell you what to do differently for Valentine’s Day. The first difference is that you will use heart-shaped cookie cutters. Wilton has a great set of six different sizes of the exact same heart . Having the same shape in different sizes will give you more creative opportunities when you get to decorating. Make the same frosting, but this time you need only three colors: light pink, white and dark red. White, you will have; light pink is made by putting a small amount of red dye in white frosting, and dark red is made with several drops of red dye and one drop of blue dye (be careful with the blue, or your frosting will turn out black). The technique for decorating heart cookies is the same one I used for my Christmas trees in December. Frost each heart with light pink frosting. Paint a few strokes of dark red on each heart. Paint a few of the small hearts plain white or dark red. While the frosting is still wet, decorate the large heart cookies with the small ones. Remember, on Sunday or Monday, go to your local craft sale and stock up on 75% off Valentines Day merchandise for next year. Keep in mind that anything you find in a solid color (red, white, silver, gold) can be used for other holidays. Domestic Goddess Reminder: Next Saturday is Valentines Day. I’ll have a cookie-making post on Tuesday. If you are going to make heart-shaped cutout sugar cookies (as I am in this column), use the recipe from my column, “The Easiest Holiday Cookies Ever! Part One,” to make your dough and freeze it this weekend. I like the first two steps; it’s the third step that gets me. Make the dough now and freeze it. When it comes time to make cookies in December, you will be really pleased you have that done. Wait to roll and bake the cookies; however, because baked cookies are very delicate and likely to break before you have a chance to decorate them. (Although broken cookies are magnificent crumbled up and served over fruit.) Here’s the recipe I use. It works when you freeze it and roll it out later, and it tastes great. I divide it into three batches that I freeze. 2. Add egg and vanilla, beat well. 3. Measure and mix in flour and baking powder. (I mix the two together before putting them in the dough). 4. 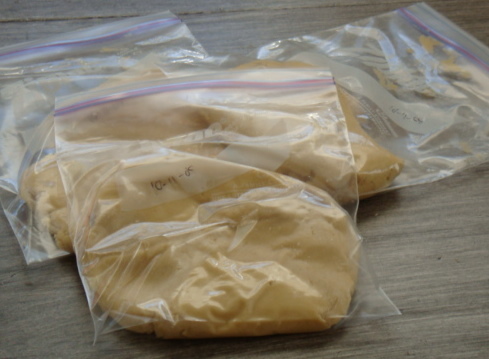 Divide dough in three batches, label and freeze. If you must know… For 1/8” cookies, bake 5 min. @ 400 degrees. 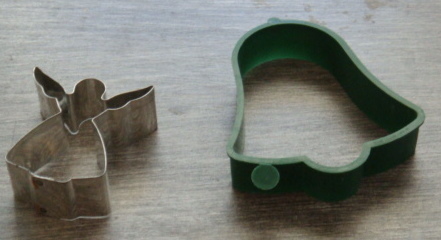 The easiest cookie cutters to use are those with the fewest “appendages”. For example, a bell shaped cookie cutter will make cookies that are much easier to handle than a fussy angel-shaped cookie cutter. If you have young children, or if any of you are easily frustrated, easy cookie cutters are a must. 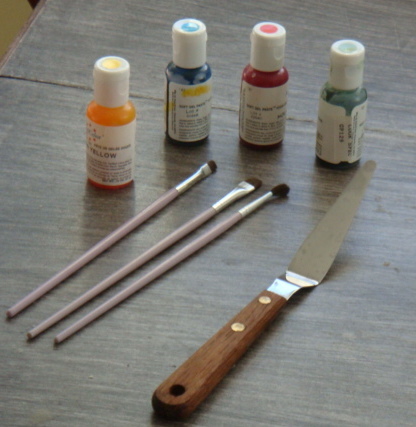 While you are at the decorating store, buy: a small angled and tapered spatula that is designed especially for icing cookies, fantastic green, red, yellow and blue food dyes (they will be so much better and more complex than what you can buy at the grocery store), decorating paintbrushes (I’ve tried dime store paintbrushes, but the bristles fall out, which is unacceptable when you are making food.). Don’t buy anything that won’t “dry”. 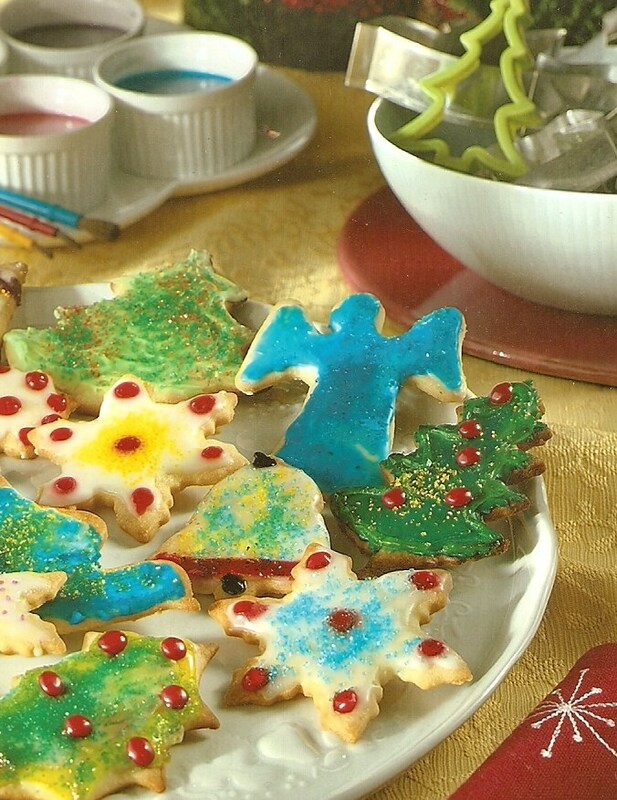 “Gel” decorating products look great; but the next day, the cookies are still sticky. Make sure that everything you buy for decorating will eventually harden. At a decorating store, the clerk will know what hardens and what doesn’t. I’ll tell you what I know about rolling and baking cookies in Part 2 of this series and give you some ideas for decorating in Part 3. Keep in mind though, that I don’t like decorating; so my decorating tips will be along the lines of easy-and-quick (but fabulous).